“Why should I buy from you?” is on every prospect's mind. To answer that question, you need to understand what makes your business different from your competition — in a way that’s meaningful to prospects. These differentiators are components of a successful brand. You may even be able to charge more because of that edge. The Red Block Analysis is a marketing research hack we created to help our clients take a marketing point of view, which is the ability to see a business through the target audience’s eyes. The first step involves generating a list of close competitors to measure your business against. Identify keywords: These are words or phrases you imagine your prospects would use to find a business like yours. Be specific by niche, i.e., “physical therapist” may be too general. “Children’s physical therapist” could be just right. The more competitive your industry, the more specific you’ll need to be. Keep in mind the words your prospect would be looking for — avoid jargon they wouldn’t know or use. Use those keywords to search Google (because that's what your prospect is most likely doing too). It works even better when you add your location, which makes sense since most services are provided locally. 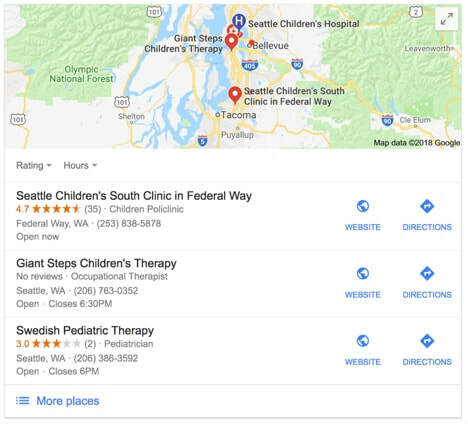 For example, “Seattle children’s physical therapist.” Immediately you can see who the possible competition is, at least by Google’s ranking. If you're not using a location, scroll down the search results page to find the first 5 or so companies like yours. You’ll need to skip over the ads and directory sites (like Yelp) and go several pages deep. You may need to further refine your search terms and use your judgment to narrow the list to find the closest competitors. Tip: Log out of your Google account or search “Incognito” (an option in the Chrome browser), so the search isn’t biased by Google knowing who you are or your search history. The locations of the businesses may still be related to the location of your IP address, however. Make sure it's within your service area. Visit each site and create a competitive chart of what each offers; you may want to use spreadsheet software for this. Place the companies you want to compare across the top (add your company too, so you’re included in the comparison). Review your site and the others to create a list of features and services offered, and run that down the left hand side. Visit each site’s main menu, then research the appropriate pages. You could simply look for "services" in the main menu, or as in the example below, it's broken out by the "kids and teens" specialty. Make the list as complete as possible. For example, don’t exclude extras like free parking, accepting credit cards or in this case, insurance. These may be benefits prospects consider valuable. Place an X in the boxes where each company, including yours, provides the particular service. Review the X’s — if everyone’s got them, you can probably ignore these services for now — they are “givens” — everyone has them and you should too. It’s what is expected, but won’t help you stand out. If only one or two others have an X, keep an eye on these. They may be something you can leverage to create a more valuable or unique service offering, particularly when combined with something others don’t have. More importantly, look for the empty spots, the “gaps” — if you’re missing services where other’s have X’s, you may need to come up to speed. If you have X’s where others don’t, and remember, they need to be services that your prospects find valuable, these are your differentiators. If you’ve been keeping current with trends in your market, you may discover opportunities for new services to offer. Add these to the list. Don’t rely on competitors to think of everything. If you can be first at something, or ride the wave of a trend, that may be just what you should focus on to build differentiation into your service offering. Understanding your prospect and how they view your business in the midst of competition is essential to standing out in a crowded marketplace. A Red Block Analysis can help you find ways to differentiate your services in ways that are meaningful to prospects. If you can communicate these differences clearly, your marketing efforts are going to be more effective. You'll be the business chosen more often and ultimately you’ll earn more, contributing to the long term growth of your business.